So, I finally got some time to collect my ideas about Vuk’s latest post on market monetarism in one post. The main question was if NGDPLT (NGDP level targeting) can bring major economies out of current slump. Vuk believes that, structural shock being the main reason we are (still) in the slump, monetary stimulus cant’ help a lot. On the other side, my view is that CBs (central banks) caused a big part of the slump by conducting overly tight policy in face of the heightened money demand. I do not deny there arent any structural problems, as you will read in the rest of the post. Unfortunately for everyone, I have some problems focusing and that’s why I write this much instead of writing a comment on the post. I always cram my posts with some additional ideas I may have. One good thing for me i that this way I may get a feedback from Vuk (or anyone else reading the posts). I was so sure you’re going to take up on that sentence, but I put it in anyways, for the sake of the debate :D.
You remember, in my post, I wrote, I had a “moral” problem. It was exactly the point you made about making things easier for irresponsible governments. Unlike some other of my colleagues, Im a bloodsucking neoliberal who knows governments never learn, especially when they have strong backing by the media and general public opinion about bloodsucking free market prophets such as myself. Pain is sometimes necessary, but how much/long? If part of it was caused by monetary policy, that part must be resolved. Thats where my problem with the whole thing lies. Some progress in reforms in EU has been made. At the same time additional taxes, regulations, “rescue”/transfer” funds will act as a brake for the positive labour market reforms, privatizations and other moves being made. What the world needs is a stable monetary environment, with clear goals and instruments to reach them. And this is where I believe NGDPLT is important (not perfect), it is a policy rule that is neutral. A lot of metrics are getting distorted today because the fall in NGDP was that drastic (like Greek debt/gdp), if NGDPLT was implemented, things would have looked a lot different today. I know we are talking of the effects of the NGDPLT as a short term stimulus, but I find it just hard to asses it from that short term point of view. On the other hand if the ECB moves back to the bad habit of conditioning monetary policy on political outcome then once again the markets will start worrying about the finer details of Italian and Spanish politics. That’s obviously a problem. With NGDPLT markets wouldn’t probably be focused on that so much. It would be easier to asses how much of the stress is reall ycaused by the irresponsibility of governments. The problem of PIIGS yields is the problem of ECB conducting monetary policy trough a interest rate channel – hence the need for institutional reform in this environment. I dont even want to talk about fiscal multipliers, for me, its such a terrible concept, because, unlike neutral monetary policy it is a very clear intervention in allocation. In the most simple words, in market monetarist view, fiscal multiplier is 0, since NGDP or inflation targeting bank will offset any rise/fall in AD caused by fiscal side – this is known as the Sumner critique, and also this is a part of explanation what is happening today in Europe. Regarding “Draghi’s promise”: most of the uncertainities about market conditions (yields) were relieved. I never claimed anything structural changed in the economy of Spain. Notice here, I dont even dispute the notion that there are structural problems that need to be solved, and that ECB won’t be able to solve them. Some of the problems are directly related to institutional setting of the Eurozone, and this is something where ECB can give “recommendations”, but it can’t solve them. I have some ideas how NGDPLT could help overcome some of the challenges arising from the current Eurozone setting, but, more about it some other time. You can take a look at the effects on business/consumer confidence. But I refered to Draghis words relating to the markets – financial markets. 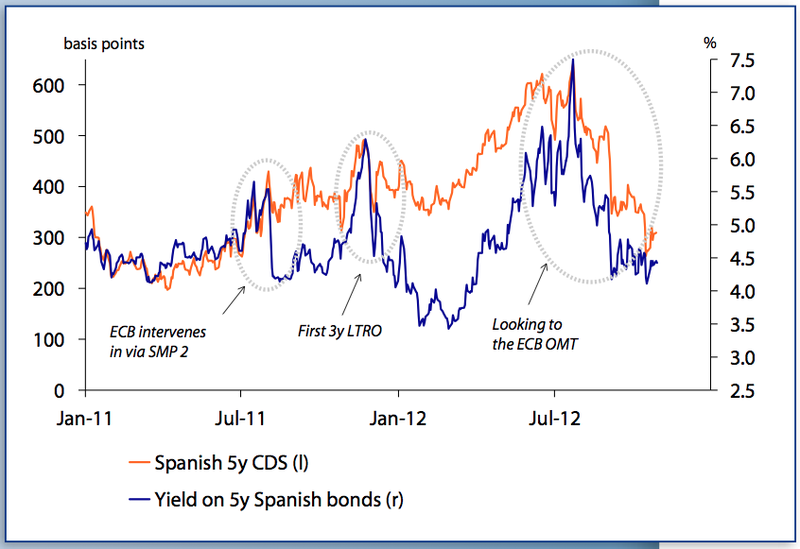 Here are Spanish yields from a Rabobank report, question is will it last, especially regarding to the previous paragraph. Rabobank people, as you can see consider the falling yield and CDS as part of “Looking to OMT”. In a way they are right. But on the other side, markets would push Spain over the cliff to OMT (ESM) if they deemed it was necessary, but they went other way – doing most of Draghis work. The logic of OMTs in a way showcases the Sumner critique. But, what I believe to be more important is the Target 2 balance, showing that situation of “internal” Eurosystem payments are beginning to stabilize, after Draghis “promise”. 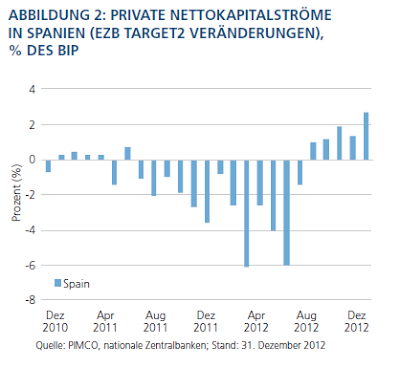 I saw this situation as one of big risks for the Eurozone (Eurosystem). Regarding consumer/business confidence, as I said, I dont think you can get a lot from that data. Consumers don’t see monetary policy in terms of income ,yet 😉 , but in terms of inflation. Im no institutionalist, so in my view relative price signals are important for allocation of investment and stable nominal environment is critical then. In that sense Draghi has no effect on allocation, but ECB can influence stability. Consumer confidence can be strongly related to the performance of labour market, which by now is terrible. If monetary policy solved a big part of the NGDP gap, at least the part we can agree(?) it caused, situation on labour markets wouldn’t be like this. Since a lot of “toxic” investments pulled down some healthy assets with them, we have a much wider crisis than was necessary. Dont forget subprime was 3% of the mortage market. Greek GDP was also 3%(?) of the Eurozone economy. Also debt/NGDP ratios wouldn’t explode as much, and healthy parts of the economy wouldn’t be starved because there is a need for cleansing of the malinvestments in some sectors. And that is the part of the economy I am concerned with right now, those which are getting clobbered because there are some mistakes in the system. NGDPLT would solve a huge part of this. The question is if you agree with market monetarist view that there is elevated demand for money (money and assets used as money) that isn’t satisfied. Also do you see inflation and NGDP as the best indicators of monetary policy stance? Its not the idea that Fed had tight policy, but policy was tight in face what was happening on the markets. Effectively markets were signaling tight policy and rising money demand. MMs will argue NGDP fall shows this fact (tightness). NGDP was collapsing long before Lehman bankruptcy, you can’t argue that this huge fall in NGDP happened last 15 days of the quarter? If you take a look at the money market spreads, you will see they were rising long before the Lehman collapse. Markets were screaming that money was tight. Also don’t forget the problems of Feds primary dealer system, one can argue that even if the Fed saw what was happening, this could have been a bottleneck for future action. Now, lets take the hot potato idea to the extreme. Imagine CB bought all financial assets and then, it sets out to buy your house, gives you money for it and throws you on the street. I guess you would set out to buy a new house, flat, cardboard box etc. Off-course this is imaginary but illustrates the mechanism. From my perspective, CBs dont even have to try to throw the “hot potato” in terms of excess money. If Fed satisfies the elevated money demand + commits to a rule based policy as NGDPLT to ensure stable environment for endogenous money creation, especially in asset creation, it will fulfill its role in my view. I liked Nick Rowe’s “story”how (fiat) money is the only asset in all markets. If there is shortage of money, there is a shortage of realized exchanges relating to the possible optimum. I think it is enough to satisfy demand to ensure the monetary policy job is done, and then, maybe, you can think in terms of the following view of mine. l’ll give you a punching bag right now, but I imagine it looking like this. 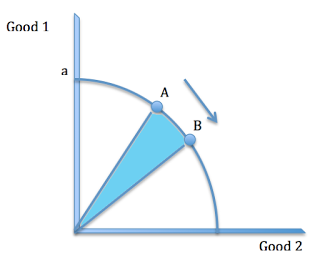 B represents some supply shock induced deviation. Now, in NGDPLT monetary policy is neutral. It should keep the nominal demand stable on the path. All the reactions can happen in a stable nominal environment. Shaded are shows the distortion and the loss of the nominal income. That results in move from a -> b.
Nominal income deviated from the path as a result. Now, in growth rate targeting regime (or inflation targeting), this would be fine and CB wouldn’t have to make up for the “mistake”. If you regard NGDP as a stance of monetary policy, b would mean the MP is tight. 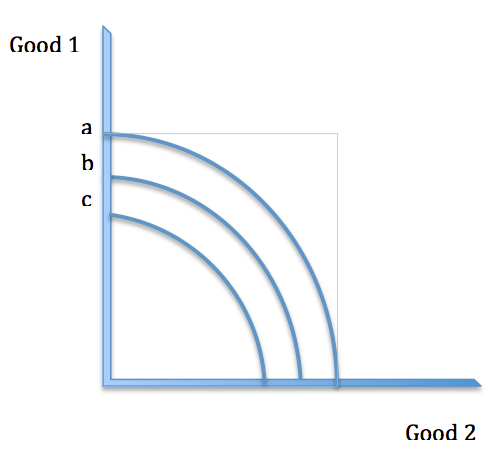 When the nominal environment deviates as well, you have a “double” problem, creating a sort of feedback loop. Nominal income falls – for example, cash flows from all MBS, not just those which were subprime or some other that are in “trouble” are affected. Now, general nominal AD may deviate from the “optimum”, but monetary policy doing the level targeting, will do everything to make up for the shortfall (and bring the situation back to a+level target in t+1). It will be easier to allocate resources from distressed sectors then. Now demand for subprime housing will decline, but other asset classes will not have problem with distressed prices. This crunch in a part of a market can occur if there is a general uncertainty (call it information asimetry? ), counterparty risk on the markets, creating a vicious circle from market liquidity to funding liquidity, back to market liquidity and so forth, distorting all possible asset classes. In that moment money demand explodes further / velocity is falling. Then further decline (to point c) in nominal income because MP was tight is certain. 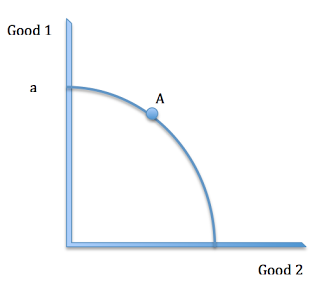 Why can’t the discovery of some other equilibrium/ return to A (if B was unsustainable) be easier in situation where money is tight? I think its because if some other healthy sector is affected by a fall in nominal income (tight policy – take a look at role of money in all markets) it will not be able to accommodate the adjustment. I dont know enough about measurements of output gaps and will appreciate any of your or someone else’s input on my thoughts. Insofar we can agree that Great Moderation is a period from 1987, do you believe that, as you say, “unsustainable system” was created from that point? 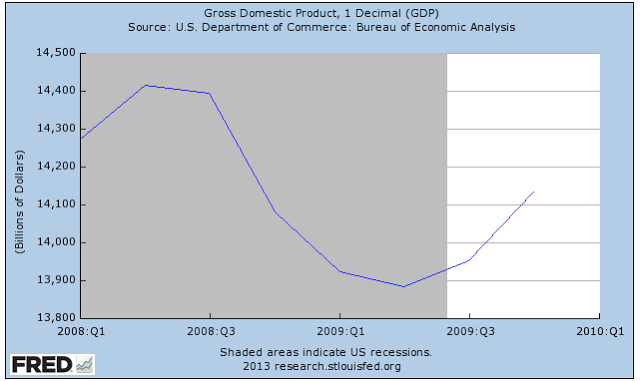 Then I see a reason to doubt the pre crisis path. If problems of unsustainability were “created” (unsustainability began to amass?) at some other point later (1999 – with CRA; 2001-2003 rates too low for too long etc) than path of NGDP resulting created by the Great moderation doesn’t have to be questioned to the extent that “it wasn’t all bad” and maybe it can be continued – than there is some sense in trying to make up for past mistakes and continue the same path. 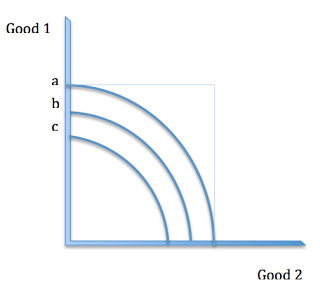 Now, lets return to the graph idea (if it has any merit) and think of it in terms of the shock. Basically, If we accept that level path US embarked on since the 1987 was in fact the begin of an unsustainable amassment of instabilities that culminated in 2007, then I see nominal AD, permanently falling to the level (b), acceptable. That would mean NGDP was above some long term trend from then. Dont get me wrong, there were a lot of mistakes Fed did during these 20yrs, but lets say those were repairable and did not have long lasting effects – unless there are some, you believe are responsible for the excesses I mention in the next sentence. So, on the other side, if we accept that there were certain excesses caused by unsustainable policies (be it by Fed, Governments, of exogenous nature…) from some point during the Great Moderation to Q3/2008, and some of those can be seen as the “beginning” of the end for the system set up that way, do we really need to say, that underlying NGDP level path was totally unsustainable? Then I do see a reason for monetary policy to try to get to the pre crisis level path (a). Lets call this scenario “bridging the gap”. Even if there were periods of unsustainable growth, Im still not really convinced that it brings long term problems with it. Its not like Americans or Europeans became lazier, les innovative etc. There are restraints for future dynamism of US and EU economies stemming from the responses to the Crisis, but there is no reason why CBs shouldn’t start targeting nominal income and bringing it back to precrisis path. Also, another problem, the way I see it, is, that in case of a negative supply shock and monetary policy that responded appropriately , we would see a rise in inflation, which didnt occur. If we say that structural shock is making this impossible (I see Europe being a bigger problem here), CBs can at least solve the problems they caused when they tightened the policy (back to b). My problem is on the perception of the rule itself (NGDPLT) as a credible enough mechanism to pull us out of a recession. where I see switch to NGDPLT helping much more than you believe it can. 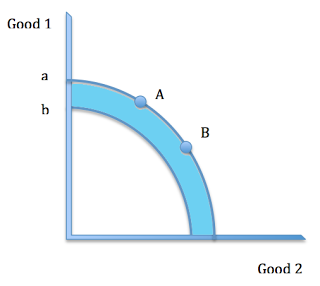 In that sense, MP can bring back the path at least to b, where I see you observing the c as the “new normal” until structural reforms are implemented – or b if you do agree that part of the problem is the tight MP. NGDPLT, in my view, can’t resolve all the problems (as in my previous post, you see that I do agree with you on some underlying real growth problems resulting from the problems with the malinvestment “legacy”) but it will create stability for the unaffected parts of the economy as well as raise nominal incomes in terms of the output lost because of the monetary policy mistakes (tight stance). If only an ADshock happened, then great, if not, then we will know monetary policy did all it could (and should). Returning to the pre-crisis trend in NGDP doesnt mean returning to the same patterns in the economy (B), it means ensuring conductive environment and an opportunity for these patterns to change (probably to A). Regarding Bullards presentation, Sumner had posts (1, 2) so take a look.